The new Quantum represents a major evolution in Black Diamond's technical/alpine backpack lineup. If you've admired the sleek functionality of Black Diamond's climbing packs, but found them a bit wanting when it comes to carrying big loads, you'll immediately notice the Quantum's improvements. By any measure, the Quantum's suspension and padding are a major leap above previous packs like the Shadow or the Predator. At first glance, you may well find yourself wondering if someone shipped you a Gregory by mistake. Can such thick, well-padded waistbelts and shoulder straps really belong to a BD pack? Yes indeed—and paired with this new harness is a beefy suspension that makes the Quantum Black Diamond's first true approach pack. Carrying capacity is always the first trait I look for in a new overnight pack. What better way is there to test a pack than to stuff it full of climbing gear, strap skis to it, and climb 5000 vertical feet over talus? 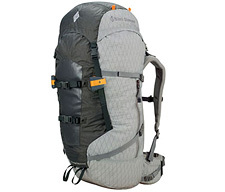 Carrying skis 'n gear with a 45 liter Quantum, I was immediately impressed with the pack's solidity. The load stayed high and tight against my back, and even my skis felt welded on. As for volume, a generous expansion collar allows the Quantum to gain an extra ten or more liters of volume if needed. In the field, I was able to get my ski boots, overnight gear, and climbing gear to fit inside a 45L Quantum—perfect. Black Diamond has once again changed base fabrics with the Quantum: "Ultralight, durable and water-shedding VX 21 Dimension Polyant laminated fabric and lined with lightweight 30d SilNylon." The result feels positively bombproof—much more rugged than the old silnylon Shadow. Interwoven into the fabric is a crisscross of reinforcing fibers, like a radial tire. Expect a long life with this pack no matter what you throw at it. After lugging 45-55 pounds up and down the eastern Sierra with both a 45 and 55-liter Quantum, I got a good sense of what the pack was capable of. First of all, the waistbelt and shoulder padding are outstanding—the best by far of any Black Diamond pack. The design of the waistbelt spreads the load evenly around the pelvic girdle without creating hotspots or bruising. I loved it—in fact, I felt like I was carrying less weight than the numbers indicated. Black Diamond's packs have historically been designed to strip down, so that you only take as much pack with you as you actually need. The Quantum strips down effortlessly, suspension included. From a base weight of 3 lbs, 14.5 oz (45L S/M, measured), you can pull off the lid, replace the waistbelt with an included nylon strap, pull out the bivy bad, pull out the frame (thanks to strategically placed zippers), and strip the Quantum down to a very sleek two pounds, two ounces! You would think such effortless modularity would reduce the effectiveness of the suspension at least a little. In a head-to-head load carrying gruel, I wouldn't expect the Quantum to best my 5-pound Makalu Pro—but then, I don't ever ski with my Makalu. It's just too big and heavy. The Quantum, on the other hand, fits unobtrusively against your back when it's cinched down, eliminating the need to carry a second, 'summit' or ski pack. That makes the new Quantum possibly the best overnight ski pack I've yet found. As I continue using the Quantum, I continue finding more things I like about it. This is simply an outstanding pack! Climbers, general mountaineers, and even casual weekend hikers will find the Quantum's feature set hard to top.